I joined the family in Talkeetna at the end of May as a new crew member and teacher for the kids. Together we travelled back to Cordova. 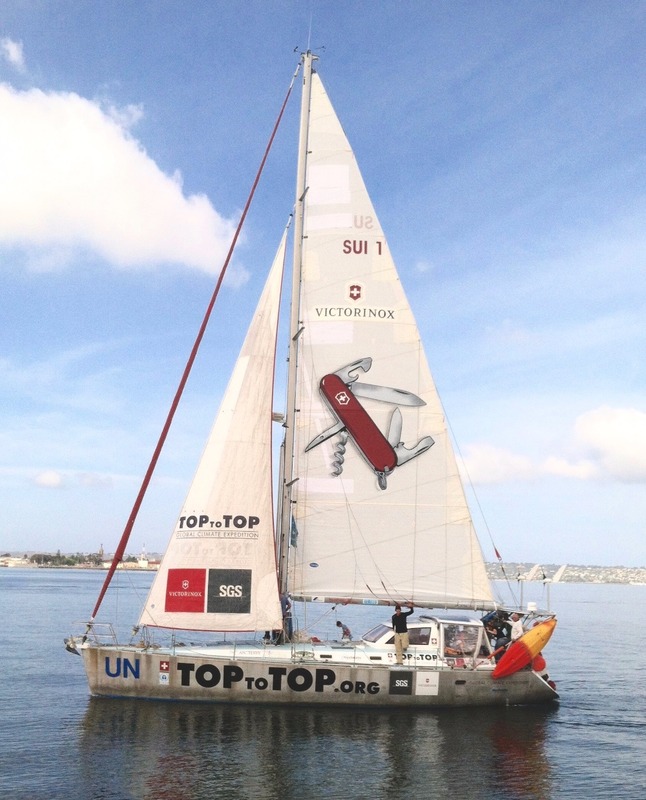 We organised some more project and got the boat ready for the next part of the expedition. 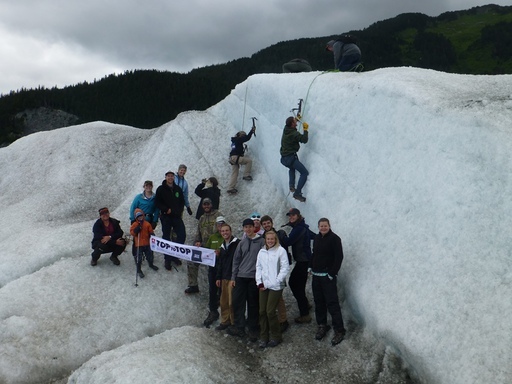 Twice we did a trip to the Sheridan Glacier with a group of students. Dario talked about the scenery and showed them the most important things about ice climbing including how to rescue someone out of a crevasse. At Sheridan Glacier climate change can be seen as it gets smaller from year to year whereas the lake between the end of the moraine and the ice is getting bigger and bigger because of the melting water. 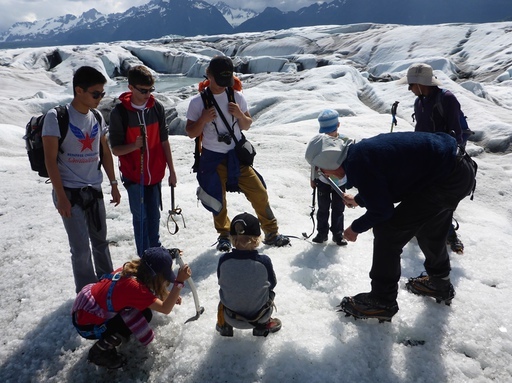 The students enjoyed the spectacular scenery and were amazed as for most of them it was their first time on a glacier. 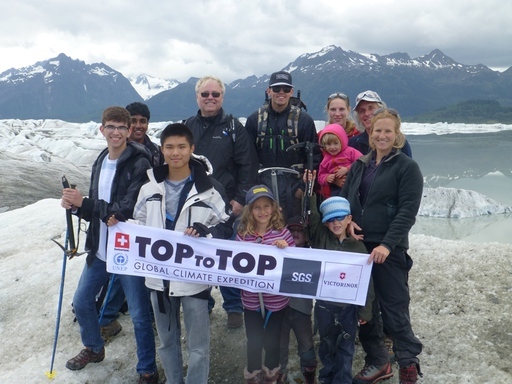 For the group of college students from Colorado Dario did a Presentation at the Orca Lodge in Cordova to tell them about the Top to Top expedition and inspire them with good examples to do something good for our planet. 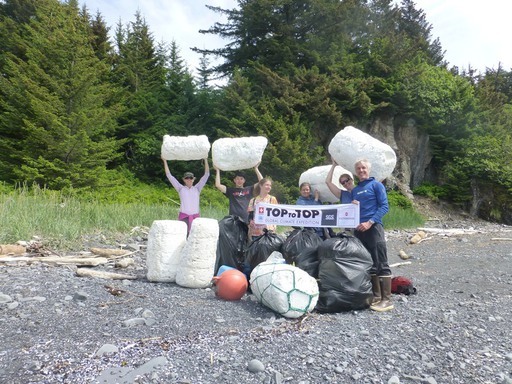 Together with the students from Colorado and the Orca Adventure Lodge, we cleaned up a beach in Hinchinbrook Island. A lot of rubbish was collected, mainly tsunami debris from Japan that was washed to the shore. 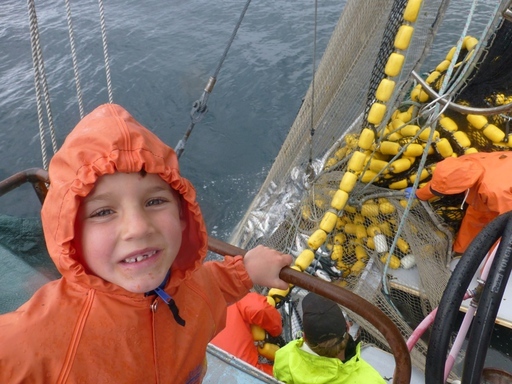 In one of the last days here in Cordova, Dario and Andri got the chance to join a fishing boat for a fishing trip. A few days later, we were invited to visit the Ocean Beauty cannery where we could go on a tour to see the different steps of the canning process. After the tender with the fish arrive, the salmons get sucked into a big tank. After the employees cut the salmon’s heads off and take the intestines out, the fish are put directly on ice. The canned salmon is cooked for 98 minutes. Big machines scale the fish and put it in cans. Our guide also showed us how they prepare the salmon to keep it fresh or to freeze it in order to ship or fly it out. Then they are put in huge containers and are flown mainly to Seattle to get packed and shipped or flown to different parts of the world from there. In 24 hours Ocean Beauty could produce about 300 tons of salmon. From the time the fish arrives, it takes only a few hours until it is prepared for sale which allows them to sell very fresh products. After having spent ten beautiful months in Cordova, it was hard to say good-bye. Sabine organised a Farwell-Party at the Skater’s Cabin where the whole family could enjoy some time with friends and thank everyone for their help and the good time they spent with them. At the end of June, we welcomed Meret, who already accompanied the family on Pachamama from Trinidad to Hawaii.